Tea is one of my favorite ingredients in skincare—it combines powerful antioxidants, minerals and other key skin-loving compounds that can make a noticeable difference in how your skin looks and feels. Let’s start with some background and then explore our favorite products using tea for skin care, and how to make them your own. All non-herbal teas come from the same plant, Camellia sinensis. 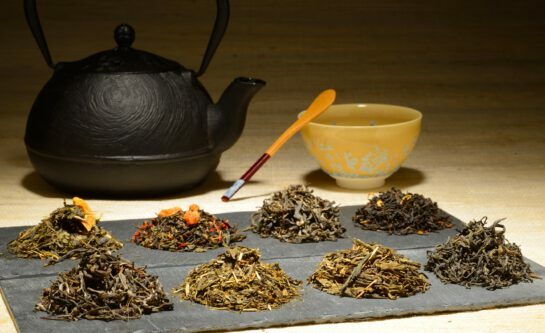 Tea was first discovered in China by Shen Nung in 2737 BC who used it as an antidote to poisonous herbs. So white, green, and black tea are different stages of the same great plant. Herbal teas, on the other hand, are infusions of herbs or other plants (often flowers) in hot water. These include chamomile, rooibos, hibiscus, and many more. It’s long been known that tea is great when consumed, but it can also work wonders when used externally. Tea is good for you! Among other things, it contains “polyphenols”—antioxidants that are great for our body inside and out. And contrary to popular belief, it’s not just green tea that’s good for you. Black, white, and red tea (rooibos) also have health-giving flavonoids and polyphenols. Until Victorian times, English upper classes pronounced it ‘tay’. It was seen as the preserve of the rich. Tea now grows in 52 countries – the oldest tree, in China, is 3,200 years old. Tea is no longer limited to the wealthy – Brits drink 165 million cups of tea a day. That’s a staggering 60.2 billion a year. (Americans on the other hand only drink around 1.4 million cups per day). However, Brits aren’t the biggest tea drinkers; Turkey takes the prize by a significant margin with 245 million cups per day! Bonus Fact: Adding tea to milk originated because early tea drinkers didn’t want to mess up their porcelain. Milk was put into the cups first to take some of the heat out of the tea, so that cups wouldn’t crack. Now, 93% of black tea is taken with milk in the UK. Sleep is imperative for glowing skin, so when you make your Chamomile Tea for your nighttime relaxation before bed, why not take those chamomile tea bags and instead of throwing them into the compost, put them on your eyes as you fall to sleep. Its relaxing properties will help the reduce the appearance of bags and puffiness. One of the most amazing things about chamomile is that its prime flavonoid is quercetin, so your skin will look revived and glowing! If black tea or “English Breakfast” tea isn’t your thing, try Jasmine Tea for not only its amazing scent, but its skin-focused benefits. Jasmine helps maturing skin by bringing the right type of balance to the surface of your skin. The most popular of all teas in skincare products tend to be green tea (including Matcha), black tea and red tea (rooibos – for more on it check out this blog). All of these are packed with the amazing antioxidants that Camellia sinensis provides us with, but green tea is known for its catechins, rooibos boasts a rich supply of the enzyme superoxide dismutase, and black tea is a hero in its high caffeine levels along with those flavonoids—it’s a fabulous stimulant. Next time you drink a cup of black tea, let the tea cool down and splash your face with it. We’ve gathered together a small collection of our tea-rich products, available here. The newest member of that Tea family is our Earl Grey Body Polish—a wonderful body scrub that is unscented. Although it does have tea in it, there is no Bergamot Oil (which gives Earl Grey its distinctive scent and flavor). We recommend adding your own scent to this and most of the other Tea products. In particular we suggest adding one or more of the following: Bergamot, Lavender, the Bloomers Essential Oil Blend, any citrus scent, Helichrysum, or your own favorites! Tea has only recently been widely recognized in the Western skin care markets; now is a great time to create your own tea-focused line. Although there are many “Green Tea Scrubs” available, the market is underserved and there is plenty of room to market any of these Tea products to delight customers in spa treatment rooms, and boutique retail stores, and farmer’s markets. Why not create an entire brand around them? Partnership opportunities abound! Let us know how you plan on using tea in your own skincare, and what scents you partner it with. Happy Making!